Jukebox the Ghost, an indie pop trio, recently finished their first leg of touring following the release of their fifth studio album, Off To The Races. Jukebox the Ghost consists of pianist and singer Ben Thornewill, guitarist and singer Tommy Siegel, and drummer Jesse Kristin. Formed at George Washington University, Jukebox the Ghost has been in the music scene for quite some time. They've toured with notable artists such as Ben Folds, Jack’s Mannequin, Ingrid Michaelson, and A Great Big World. Their high energy songs along with their unique stage presence make their shows a great experience, leaving concert-goers wanting to see them again and again. New to this tour was a VIP experience, where concert goers were invited to eat toast and drink juiceboxes with the band before the show. This idea stems from the many misheard band names the band has experienced over the years, such as Juicebox the Toast and Jukebox the Goat. If you’ve ever wondered what Jukebox the Ghost brings on tour with them, you can check out a video here. Their new album Off To The Races takes a lot of inspiration from Queen, which isn’t surprising. Jukebox the Ghost has been covering Queen songs for years now, so much that they started their own Queen-centric event, Halloqueen. Halloqueen is a show in which Jukebox the Ghost dresses up as Queen and performs two sets of songs: one of only Queen songs and one of their own songs. 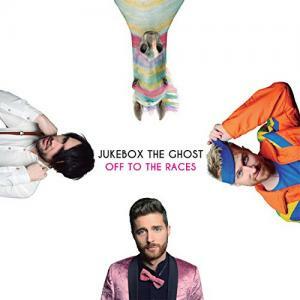 Back in October of 2017, Jukebox the Ghost even premiered the song "Fred Astaire" at their Philadelphia Halloqueen show; "Fred Astaire" is the fourth track on Off To The Races. Specifically, the track "Jumpstarted" from the new album embodies Queen the best from the vocals to the instrumentals. ”Jumpstarted” is a fun, fast paced song that starts the album off perfectly, it even references the album's title. Off To The Races brings a new Jukebox the Ghost sound, one that is more simplistic. The album departs from their quirky style and post apocalyptic concepts from Let Live and Let Ghosts and shows a new side of the band. Long time fans may think the newest album is lackluster coming from a band with four great stand alone albums, but it shows that Jukebox the Ghost is constantly evolving stylistically, and they aren’t afraid to. This album embraces the great elements of indie synth pops: repeated lyrics, hazy drawn out vocals, and simple melodies. The concept of the album revolves around the realities of life. "Everybody's Lonely" shines light on the constant feeling of loneliness in a world filled with ballads on the radio. “Time and I” shows the struggle of timing, perhaps it's the most relatable track as everyone feels that they never have enough time. "Fred Astaire" brings some lightness to the album as it's a love song, plus it has fantastic piano runs. "Boring" focuses on the realities of friends growing up and having families, while "People Go Home" shows the mundane repetition of those who have 9-5 jobs. "Colorful" ends the album, encouraging listeners to let go and embrace the fact that one’s purpose may be to just add some positivity in the world. Overall, the album’s concept isn't as strong as past Jukebox the Ghost works, but the songs are still refreshing to listen to. It’s a great album for road tripping, it’s the realities of life wrapped up in upbeat, high energy songs. This fall, Jukebox the Ghost will be on the second leg of their tour promoting Off To The Races - more information can be found on their website.